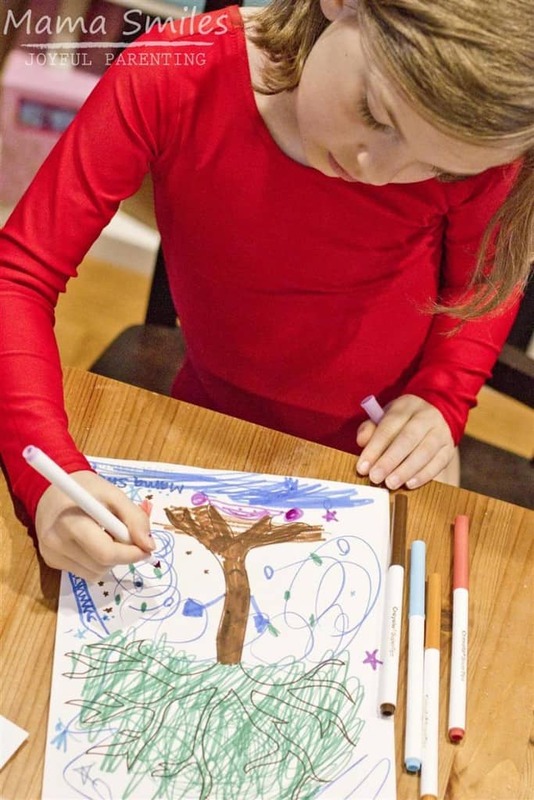 This spring tree coloring page doubles as a brilliant Pi Day themed art project! 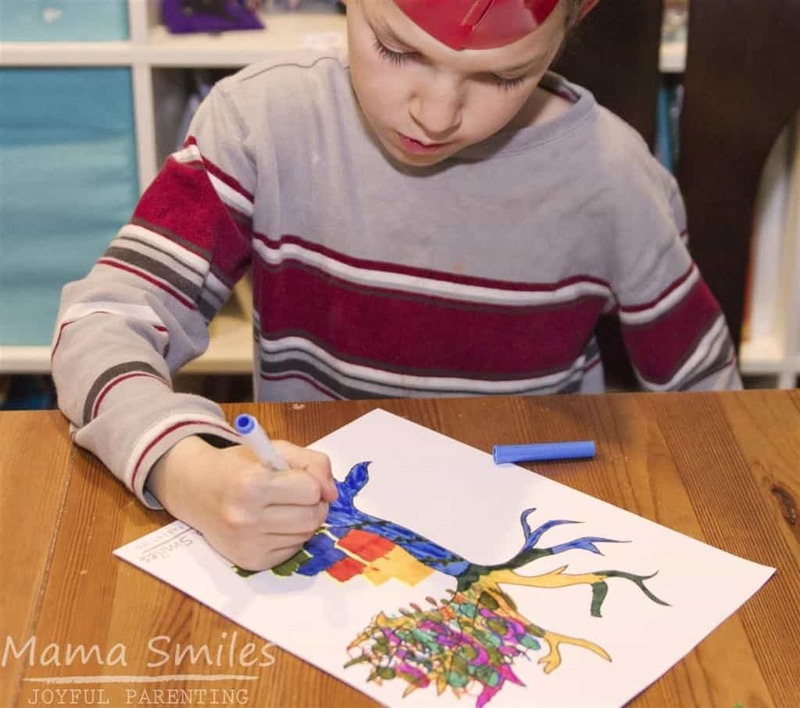 Find more fun ways to celebate Pi Day with kids! Pi Day is a very fun holiday for math geeks like me! Last year we used Cuisenaire rods to create a Pi Day Skyline, and this year I created this spring tree coloring page for the kids to decorate in honor of the day. 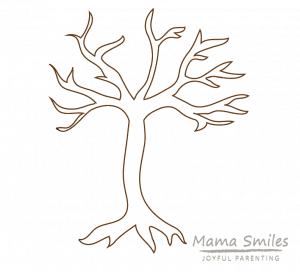 I am sharing the basic tree outline as a free printable at the end of this post. You can use it to create your own Pi Day trees! 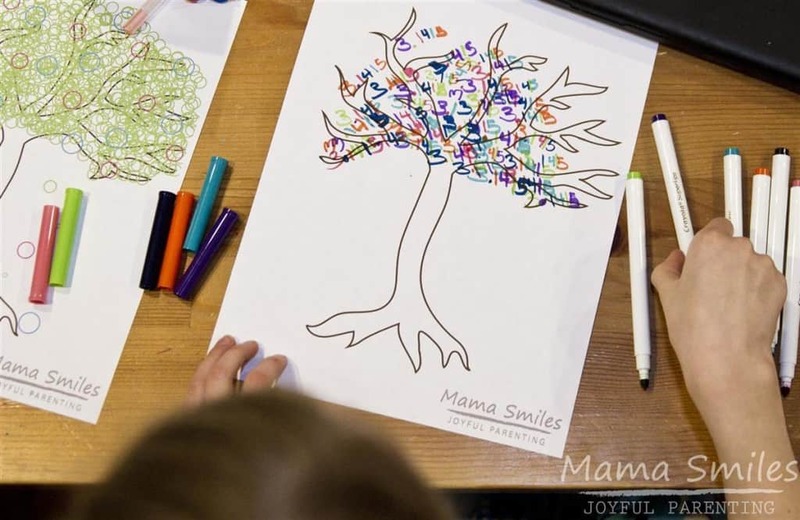 This spring tree coloring printable also works beautifully for seasonal art projects you might want to do with your kids. Print out four copies of this page and decorate one for spring, one for summer, one for fall, and one for winter! 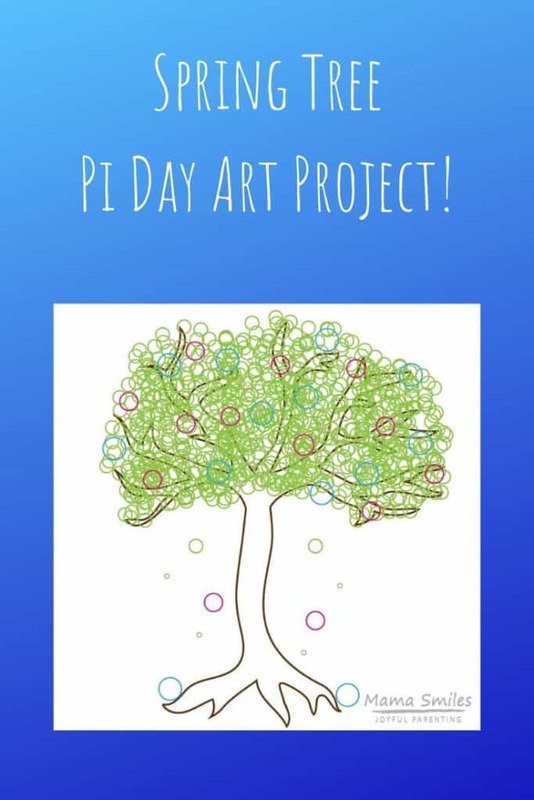 Since this is a pretty abstract art idea to give to young children, I created my own Pi Day Tree before passing the challenge off to the kids. 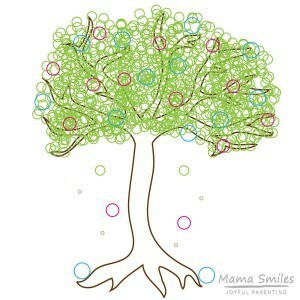 I covered the tree with circles that measured 0.3 inches, 0.1 inches, 0.4 inches, and 0.5 inches. Then I put five circles falling out of the tree on either side to represent the first five digits of Pi: 3.1415. I also matched the colors of the sizes to the responding colors of the sized Cuisenaire rods we used for our Pi Day project last year. This is what artsy math nerd moms do instead of cleaning the house. I printed out my version of the tree, as well as four blank trees so that each kid could decorate their own. It was fun to see how each child approached this task! Ten-year-old Emma is the only child who has any proper idea of what Pi is. 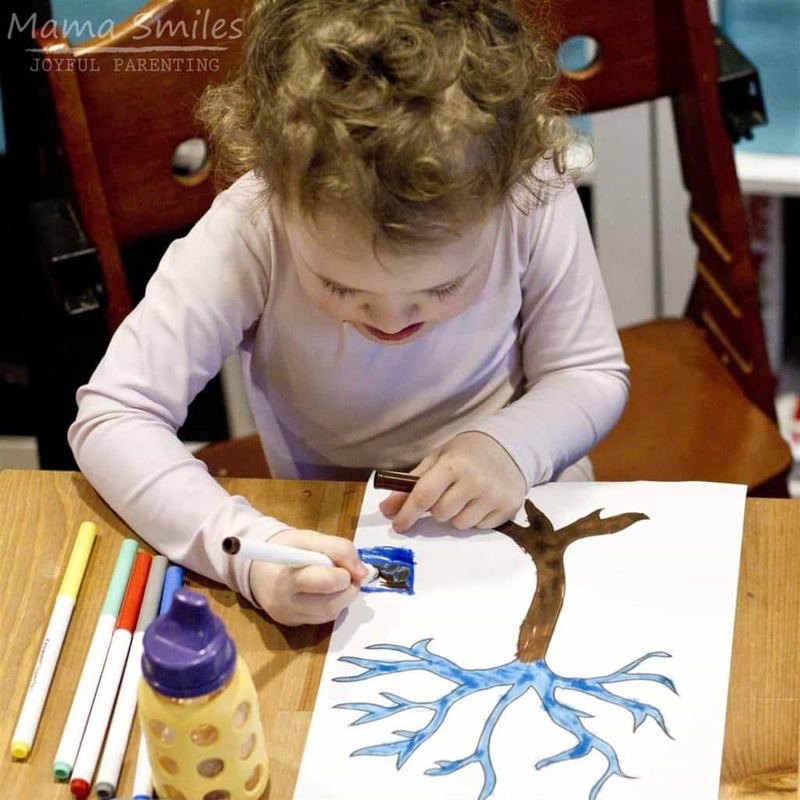 If you look at her picture at the top of this post, you will see that she actually wrote out 3.1415 to create a multicolored blossoming tree. I love the final effect! Thankfully, you don’t have to understand the subtleties of Pi to appreciate this task – and creating projects like this will help to capture the kids’ interest when their teachers introduce them to Pi in a few years. Eight-year-old Johnny was inspired by the circles of my own project. I explained to the kids that I used Cuisenaire rod colors, and you can see that explanation reflected in the blocks drawn at the base of the tree. Oh, by the way, these washable thin tip markers are awesome. We adore the case they come in, too! You snap each marker in individually, so they stay nice and neat for taking places and kids can see every single marker at a glance. Six-year-old Lily ignored the Pi Day component of this activity. She brought her tree to life – can you spot the face and arms? There is also a ladder leaning up the side, which makes me think of the Faraway Tree Stories. The stars add to the magical atmosphere, as to the swirls of blue she drew to show that it is nighttime in her drawing. Three-year-old Anna does not care about Pi at all, but she had a lovely time decorating this Frozen-inspired tree! 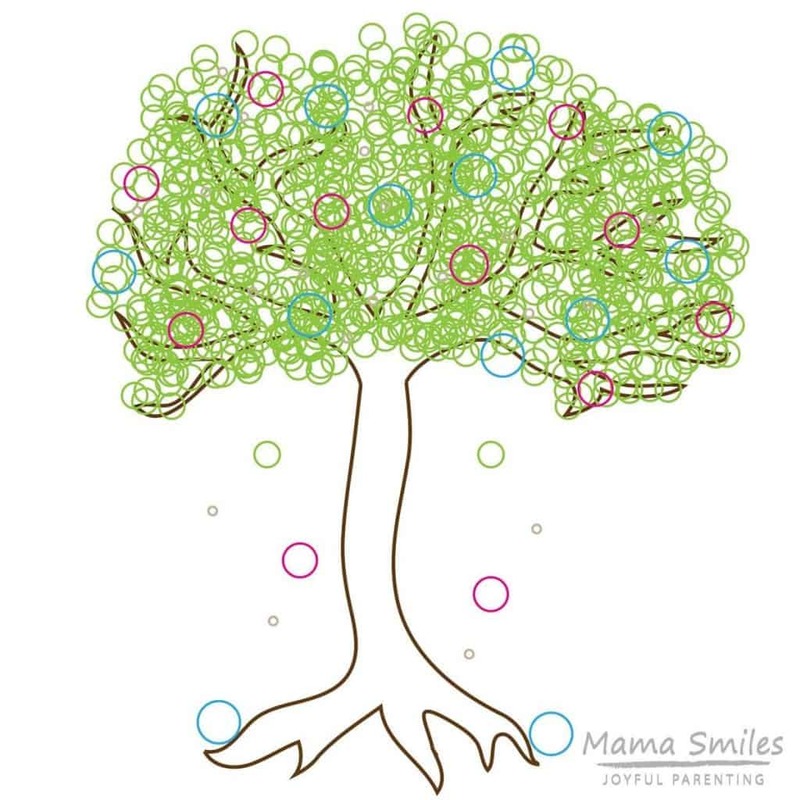 This tree outline makes for fabulous open-ended art – spring-themed, season-themed, Pi-themed, fairy-tale-themed… It is amazing how versatile a simple tree outline can be! I uploaded PDF files of both of these trees for you to enjoy! Both files will print as 8.5×11 inch coloring pages. Click on the images below to open the PDF file for printing. Happy coloring! How are you celebrating Pi Day? Do you have a favorite spring craft for us to enjoy? I love it! Though I can just imagine how long it took to make all of those little circles. At first I thought they were bands from a Rainbow Loom. This nerdy mom sews historical fashion rather than clean. Rainbow loom bands would have made for some amazing art! The circles didn’t really take that long. I cut and pasted most of them. I love your clever initial prompt. The tree looks very beautiful. I also love how each of your kids took it in a different direction! It’s so hard to come up with Pi activities for younger kids. I love your idea! !